I know this info is probably posted somewhere but can't seem to find it. Trying to find out when you have meetings in Melbourne?? Are they always in Springvale?? Do I need to join a different section or just be a member of this forum?? Would also like a phone number or branch address if possible to contact?? Have a 1966 MGB convertible with no motor that would make a cool EV conversion and light along with other EV projects. Weird. Normally I would say go out to the home directory of the AEVA website and select Branches->Melbourne->Calendar, but it doesn't appear to work for me today??? Anyway http://www.aeva.asn.au/whats_on.php has the Melbourne meetings day/time. There is a contact number there as well. To my knowledge they are always in Oakliegh. All the forums (well almost) are open so just peruse and post (as you are doing). I eventually found it on the main web page. I would love to come along to see what you are all up to on a friday. Do you need to register or being a member on the forum should be fine I pressume? Do any of you bring your toys along?? As I would like to bring my EV along, or is it just a verbal meeting?? The only meeting I ever attended was before I joined the AEVA so all are welcome. I just turned up. Can anyone answer whether Matt's "toy" would be welcome? At the Brisbane meetings, there are almost always some EVs for people look at (and owners to show off) before the meeting. The smart people bring torches to show things off, as it's dark by then. The EVs make a nice focal point for discussion before the meeting (and indeed it's usually necessary to chase people inside to start the meeting proper). Maybe we'll get sick of it (we only started this year), but I think that there will always be newbies, and someone often has something new to show off that even the seasoned EVers can gawk at and learn from. I would be bringing it on a trailer and maybe give it a quick test run if anyone in interested. I have just brought some sheets of Corflute which I will be used as a fairing to pretty it up and make it more aerodynamic. 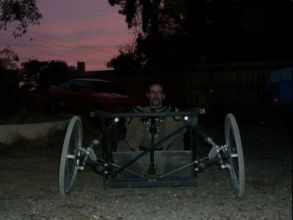 "Homemade 2kw brushless motor solarcar" once finished. Last edited by F&P on Wed, 09 Dec 2009, 06:08, edited 1 time in total.